A passenger dashes to make a connection having arrived late on a Transpennine train from Scarborough. 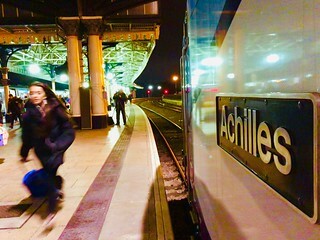 Watching the scene is 68023 ‘Achilles’, one of the locomotives that will haul new trains on the Transpennine route. With just five weeks to go until the new timetable, and crew training on the Mk5a sets yet to commence, Transpennine seem to be taking on ‘Mission Impossible’ and will have to dash themselves! In the background a photographer records the first working of a Transpennine liveried Class 68 in York. 68023 ‘Achilles’ at York having worked in from Scarborough on 0B75 crew training trip on Sunday 4th November 2018.